First things first. We must recall that a little over a year ago PDS acquired Miggy from CCI. In sum from these two deals Bailey got a 1st round pick (Senzel…which was the center piece for Stanton), Soler (which was a big piece in his acquisition for Mccutchen), Ian Happ, Bellinger, and I guess Brett Phillips for damaged goods Urias and Blake Snell If I’m missing vital parts of these two transactions, I’ll be happy to edit. CII gets reunited with Miggy. Miguel Cabrera is having a disappointing year and at his age, there’s a pretty high chance he’s not getting kept at $75. That being said, I don’t think he’s dead (unlike Urias). His numbers are down, most notably his slugging, but I kind of don’t buy one of the best hitters of all-time is done at 34. 5 points a game is a disappointment by Miggy standards, but I think better times are ahead. David Ortiz had some bad stretches in his mid 30s and was a superstar late, and I don’t think he was the hitter in his prime Miggy was. I totally get a rebuilding and moving on from Miggy and getting whatever value you can, but looking at PDS’s roster there aren’t a lot of cost commitments here. I see well under $100 bucks of keepable pitching and probably under $250 of keepable hitting. I’d say those figures are conservative and should be lower I’d say at a minimum (without other trades) PDS is going to have a ton of cash in the next auction. 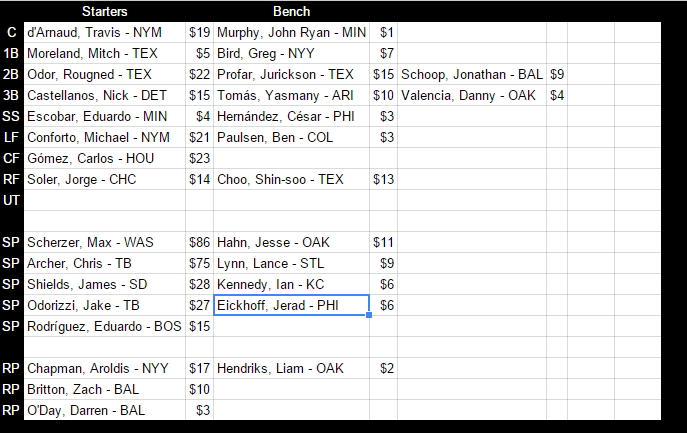 Auction cash is great, I probably overrate it more than most people, but having good players is better. PDS current projected 2018 roster highlights seem to be JD Martinez, Schoop, Jordan Montgonery (one of the year’s best pickups) and I guess Lance Lynn. All nice players. . That being said, I think this core is going to struggle in 2018, which is perfect for Urias , because I don’t think he’ll be pitching much in 2018. As a Dodgers fan, I hope I’m wrong, but Urias’ effective or even complete career may be over. I think Bailey was very wise to get what he could for Urias now, because the best case scenario is he’ll be an OK pitcher in 2019. He’s damaged goods. Chris Young Royals upside! I mean, he won a World Series pitching for them. #ringz. We were all really excited that first minor league draft and Urias was in the mix to be #1 overall. I think the shine has wore off considerably just because of this unfortunate injury. At least Urias will be DL eligible throughout the entire recovery process so a roster spot won’t be wasted. I expect Urias to give PDS very little if anything next year, but at least his $3 or whatever will be a drop in the bucket and won’t prevent them from spending on available assets. 9) The right to mention _____ in a trade review not involving him. 10) A damaged good prospect who has a lot of value in trade. I know you all thought I would mention Sucre, but I take this seriously. The cookie munching team ended their draft with a case for the best pitching staff in the league. That’s hardly even a stretch. Value was gained with a couple of guys at good values like James Shields and Jake Odorizzi. Value was lost spending on $45 on three second basemen. All of whom could easily finish outside the top ten at their position. Questionable and unreasonable risks. Things must have gone wrong here on draft day. In a vacuum, I really like Carlos Gomez, Shin-soo Choo, and Michael Conforto. Nick Castellanos and Yasmany Tomas as your third base platoon for $25? Is that a hedge? Odor, Profar and Schoop at second base? I’m not even certain they’re good trade bait. Greg Bird for $7 to not play this year I like, but this roster needs Bird this year. Moreland at first base could be okay, unlikely. Eduardo Escobar seems prime to lose his everyday job, and Travis d’Arnaud is a perfectly okay catcher. This was a case of sitting on Very Good, seeing the bullpen and decided outstanding. I’m not sold on it, but I’m not betting against Max Scherzer. Chris Archer was great last year why not repeat. James Shields seems like a safe bounce back candidate. Odorizzi is pretty good. I like Aroldis Chapman in the bullpen even if when he misses time. Zach Britton has been solid for a few years. The first four starters cemented. When you fill out 5 and 6 with a choice of Eduardo Rodriguez, Jesse Hahn or Ian Kennedy that’s pretty exciting. They’re flush with pitching. Lance Lynn to hold the DL down this year like Greg Bird for under $10 seems like a potential steal. What if James Shields is broken. If Max or Archer go down too, almost all is lost. This team paid for future in a few spots, they can definitely handle some injuries if the upside shows up. However, a lot of that bet is hinged on Max and Archer. A great bet to make, but that can change in a day. If you get a tier 2 season from Shields or Odorizzi and a tier 3 from the other you’re so sweet. Scherzer and Archer should be at the tier 1 level. That alone will allow this team to compete all year at a good level. If they’re paying attention to matchups with the hitters, perhaps there’s some three headed monster that makes a good player at one position that I’m missing. More power to them. Well actually yeah, they need more power to them.